Sony Smartwatch2 is a wrist watch style device which connects with your Android device and makes you easily access to your data from your wrist. You can view upcoming events in Google calendar, received SMS, tweets, etc. Sony Smartwatch2 has ４ types of applications. Some basic functions, such as alarm, stopwatch, timer is built in to Smartwatch2 firmware which can run stand alone, without connection to android device. Notification type app sends notification message / icon from android device to Smartwatch2. 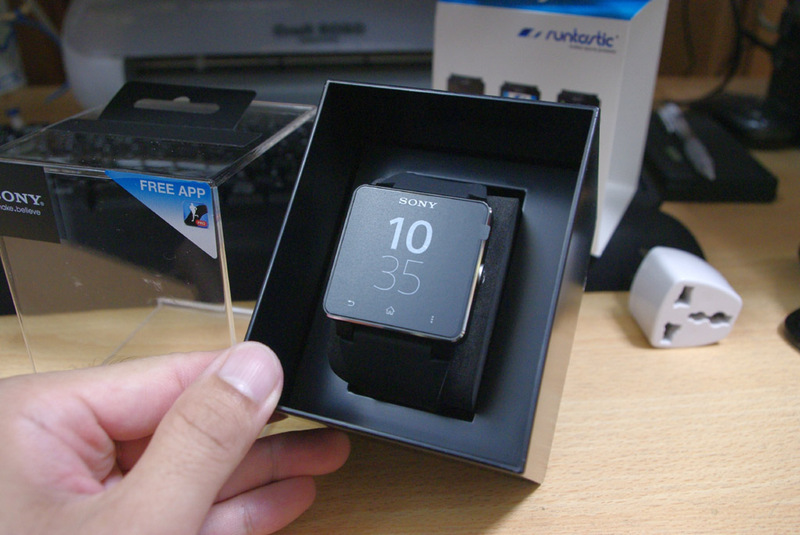 Smartwatch2 saves those notification message and notifies user. When android device is disconnected from Smartwatch2, you won’t get new notification, but you can still view saved messages on Smartwatch2. Gmail, tweet app is this type. Control type app is interactive app which can do lots of things. Smartwatch2 handles input from user and displaying contents, and all other processes are done inside android device. User input is sent from Smartwatch2 to android device, app running on android device does all processing, creating contents to be shown on screen, and screen content is sent to Smartwatch2. Therefore, since Smartwatch2 only handles UI part, android device have to be connected continuously for those type of app to run. Widget type app became available on April 2014 update. User can place widgets in watchface to customize their watchface. Internally, there are two types of widgets, which works offline and online. Online widgets needs android device to be connected to update display. This type of widgets will shown grayed out when offline. Apps you can download from Google Play are either one of notification type , control type, or widget type, and no third party developer can create built in (stand alone) type app for Smartwatch2 at this time. Q:Can anybody create app runs on Smartwatch2 stand alone? A:No, for above reason. Some watchface widget can run offline. A:Open SmartConnect, Smartwatch2, Smartwatch2 and you will see list of installed extensions. Tap on extension to open preference for each app. Q:When running app, notification only shows up at top of screen for short time. A:This is due to SmartWatch2 system design, there’s nothing developer can do about this (maybe many requests from user to Sony support makes system update to support showing full notification). Icon not found after app install. Tapping icon only shows progress and then nothing happens. Vibration always vibrates for long period of time. For most of the time, rebooting Android device fixes the problem (since most of the processes are done inside connected android device). For Xperia user, using stamina mode makes Smartwatch2 app to halt when Xperia is in sleep mode. Disable stamina mode, or add Smartwatch2 related apps to active program list. It might be caused from recent smartconnect and/or sw2 firmware update. Have you tried rebooting your android device? NK views are religious and not humanitarian in the sense of a gentiles humanitarianism, the religion still produces a humanitarian result. I can live with that kind of reoo&ilng#8230;thise kind of religious. I had the same issue where the NeFa Remote Widget wouldn’t show up on the watch. I did see in Sony app, could configure apps, etc. Uninstalling and reinstalling the app didn’t do the trick, nor did resetting the watch. Reinstall the app, after all the other apps get “loaded” on the watch. This did lose all the configured widgets,so a “backup/restore” functionality in that app would be great.